Shareholders are suing the federal government for rescuing their company from collapse. The ever-grateful corporate board could join them. Wall Street’s ingratitude is not exactly a secret. After Washington came to the rescue four years ago with the $800 billion bank bailout and ignored flagrant criminal behavior in high places, the nation’s biggest banks returned the favor with malice—an army of lobbyists to gut reform legislation, a tidal wave of political cash to defeat the Democratic president and elect banker-friendly Republicans. Leading executives like Jamie Dimon of JP Morgan Chase expressed their disdain for the meddlesome government. The shareholders of AIG, the giant insurance company the Federal Reserve bailed out with $180 billion, have now topped that impudence. Believe it or not, these investors are suing the federal government for rescuing their company from collapse. This sets a world record for breath-taking arrogance. The injured AIG shareholders claim the Fed violated their “property rights” by taking over their failing company, keeping it on life support with generous lending and restoring its solvency. Now those same shareholders want compensation from the government—insisting the central bank charged exorbitant interest rates on its loans and sold off valuable subsidiaries to revive the corporation. This is like a homeowner who sues the fire department for putting out the flames when his house is burning down. The astounding details were described by The New York Times. The imaginative skills of Wall Street lawyers seem to have no bounds, and the Justice Department must now expend a fortune in lawyers to defend the government against such an improbable claim. The legal principle invoked by the AIG investors is eminent domain, and they are urging AIG’s current management to join in the lawsuit (even though the company is running full-page newspaper ads thanking the American people for the assistance). The Fifth Amendment to the Constitution guarantees that property owners will be justly compensated if the government takes their land for public purposes—building a highway or other projects. Yes, of course. But the AIG investors do seem to have a smaller point. They argue that the Fed’s real purpose in intervening was not to help AIG but to save the largest New York financial firms like Goldman Sachs from huge losses. Those banks were holding AIG credit instruments that were likely to become worthless, but the banks were repaid at full value thanks to the Fed lending. The incestuous arrangement provoked a bad odor at the time. If AIG had gone into bankruptcy court, those banks would have taken a big hit, too. 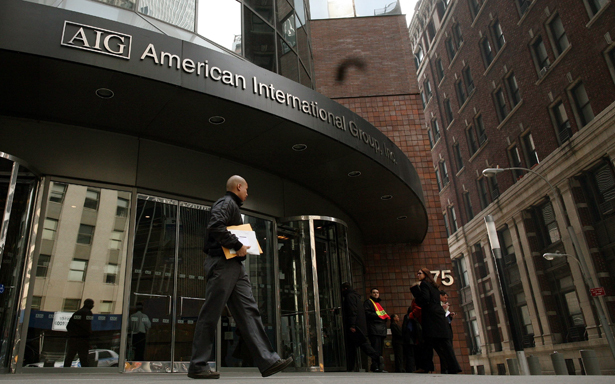 AIG, after all, is not a bank but a business corporation. The Fed bent its own standards in order to help out some old friends. It seems unlikely that a federal court will uphold the AIG investors’ argument, but a Washington judge has agreed to hear the case after a New York judge tossed it out. If the AIG shareholders win, it could put a severe crimp in the Federal Reserve’s capacity to do emergency lending in a larger crisis. A lot of Fed critics might cheer this, especially those who want to abolish the central bank altogether. That’s crazy itself. The Federal Reserve System is in need deep reform, but that task cannot be left to the reactionary right. After all, they want to put the bankers in charge with no meddling from government. This week, Greg Kaufmann proposes that the Obama administration extend the access granted to big finance to a new crowd: struggling Americans.